Stuttgart, Germany, April 6, 2004 — The SkyTeam alliance has opened a joint sales office and joint check-in desks in Stuttgart-Echterdingen Airport's new Terminal 3 recently. Sky Team is a strategic alliance Korean Air formed with six other world's major airlines including Air France, Alitalia, and Delta Air Lines. Initiated on March 28, 2004, the new joint sales and check-in services enable SkyTeam member airlines share Stuttgart counters equipped with state-of-the-art facilities for optimal efficiency. With combined 7,865 daily flights to over 500 destinations in 110 countries, SkyTeam makes life easier for frequent air travelers. The airlines' agents will offer customers a wide range of flights and destinations through SkyTeam's unsurpassed global network. On top of that, air travelers can get translation services in five different languages: German, English, Spanish, French, and Italian. The Stuttgart co-location is another example of SkyTeam's unrelenting efforts to focus on areas that provide the highest level of customer service. 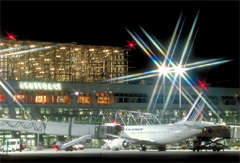 Stuttgart has become the 20th airport in the world to be equipped with the alliance's top-of-the-line installations. The new facilities at Stuttgart follow similar openings in Athens, Barcelona, Beijing, Brussels, Buenos Aires, Caracas, Geneva, Lagos, Manchester, Mexico City, Munich, Milan-Malpensa, Moscow-Sheremetyevo, Paris-CDG2, Rome, Tel Aviv, Tunis, Venice, and Vienna. Since its inception, SkyTeam's prime objective has been to guarantee consistent and high-quality service. Joint sales offices and shared ticket counters are just some of the benefits made available to customers. In addition to the shared ticket counters at those airports, Elite Plus members or passengers traveling in First or Business Class can enjoy any one of 338 airport lounges. 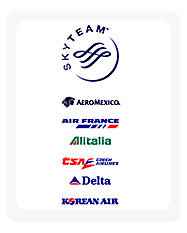 SkyTeam is the global airline alliance formed among AeroMexico, Air France, Alitalia, CSA Czech Airlines, Delta Air Lines, and Korean Air. Through one of the world's most extensive hub networks, SkyTeam offers its 212 million annual passengers a worldwide system of over 7,600 daily flights covering all major destinations. For further details visit SkyTeam's official website.